Sticky Diamonds Easter Egg from Gamomat is a straightforward slot with easy to follow rules for players of all levels to enjoy. This is a classic fruit, sticky diamonds game with an Easter twist to it consisting of colourful eggs laying around in the backdrop and even next to the fiery, hot seven symbol. Not only can you benefit greatly from the free spins round, the mystery retrigger of the free spins round and the popular gamble feature but, the symbol payouts are also pleasant in this slot! Bets in Sticky Diamonds Easter Egg range from a minimum bet of € 0.1 per spin to a maximum bet of € 100 per spin. The red diamond is a wild symbol which substitutes for all symbols except for the scatter symbol! The scatter is a huge lightning strike outside of a circular window which occurs only during the base gameplay. Aside from these two special symbols are a flaming 7 symbol with an Easter egg, a steel bell, half of a watermelon, a cluster of purple grapes, a purple plum, an orange, a lemon and a pair of cherries. In Sticky Diamonds Easter Egg, you need to land three, four or five scatters to trigger eleven free games! During the free games features any visible diamond symbol will turn into a sticky symbol. What’s more is that after the first series of free games, there is the random chance of getting a mystery retrigger which means a second free games series will start right after the first one! 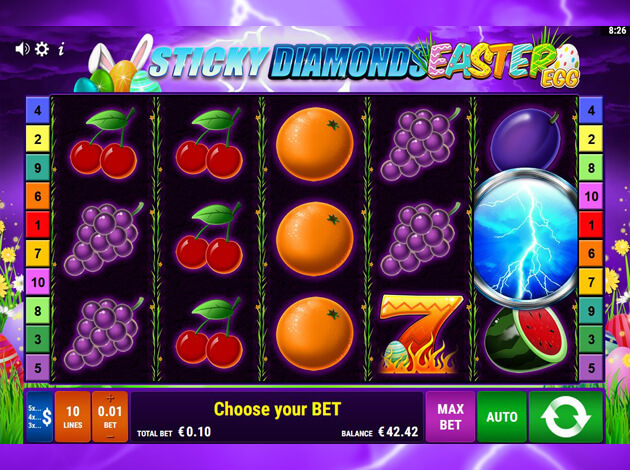 Sticky Diamonds Easter Egg also features the very popular gamble feature from Gamomat. There is either the card gamble or the ladder gamble which you can choose between when you trigger the gamble feature in this game, which is triggered frequently. If you choose to play the card gamble, all you’ll need to do is make a guess as to whether the next card will be either black or red. If you make the wrong choice, then you will lose your winnings and be brought back to the base game. However, if you make the correct guess, then you can guess again and double your winnings once more. If you don’t want to take the risk once again, you can always choose to collect the winnings you’ve made up until this point. If you choose to play the ladder gamble, you’ll need to click the button at the right moment in order to move up the ladder and increase your winnings. You have as many opportunities to do so unless you get to the very bottom where the total is zero which will bring you back to the base game without any winnings. In the case that you don’t want to take the risk to double your winnings, you can simply collect what you’ve won and not have to gamble anything at all. The choice is entirely yours! The highest paying symbol is the flaming 7 symbol which can earn you up to 200x your total bet if you land five of a kind! The lightning scatter symbol can reward you with up to 100x your total bet and is the second highest paying symbol in the game. The bell symbol can reward you with up to 50x your total bet while the watermelon and grapes can reward you with up to 20x your total bet. The plum, orange, lemon and cherries are the lowest paying symbols rewarding you with up to 10x your total bet for five of a kind. The look and feel of this slot are more traditional like the more classic, old-fashioned slots. There isn’t a soundtrack playing when the reels are at a standstill however when you spin the reels, classic slot music and sound effects will be played as well as when you land on a winning combination. Behind the reels you will see a dark purple sky with large lightning bolts shooting down. You will also see a field of grass and colourful eggs laying throughout among the wild flowers. The autoplay button can be found to the left of the spin button while the paytable can be found to the very left of the play screen right next to the lines button. Sticky Diamond Easter Egg from Gamomat is a unique take on the classic fruit, diamond game. Here you get to enjoy various Easter aspects in this slot, getting you in the holiday spirit with colourful Easter eggs laying around. With the free games feature in this slot, you’ll have more than enough chances to earn some potential wins especially since there’s also the opportunity for a mystery retrigger which will give you even more free games! You can also benefit from the frequently appearing gamble feature that Gamomat is well-known for implementing into their games. Play Sticky Diamonds Easter Egg at Videoslots today! Gamomat is a German game developer producing top-notch slots, casino games and jackpot games for the international market. You can find their top performing games in land based casinos, online and mobile sectors as well. 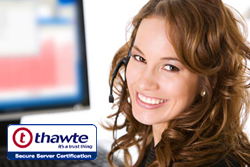 The company started out in 2008, so they’ve already got plenty of experience in the industry. Their products are developed using the latest technological standards, with more than 250 game titles in their portfolio. They’re proud to develop all their games in HTML5, and their mobile games are optimised for iOS and Android systems, in both portrait and landscape mode so as not to compromise on the quality of their games. Their games are all produced using state-of-the-art graphics, high quality sound and impressive animations that perform across all platforms. Gamomat also has an interesting section in their portfolio which consists of social games.